A new year. A new beginning. A day of judgment and resolution. This is Rosh Hashanah, the day that calls us to reflect and repent. The centerpoint of the days service is the shofar. A congregation stands at attention, intently awaiting the first clear blast of the horn that recalls the ram that replaced Isaac on his father's altar. For many adults, some of their most vivid memories are the shofar's notes - sometimes firm and piercing, sometimes hesitant and hoarse - and the slice of apple dipped into a saucer of honey. "Give us a sweet year. Give us a healthy year. Give us a successful year. Our Father, our King, be gracious to us..."
The prayers, yearnings, and hopes of Rosh Hashanah are the opening wedge of the Days of Awe. In this book, a host of them are explained and illuminated. This is an informative and inspiring volume. 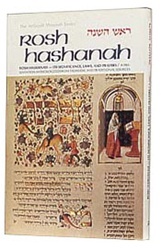 To read it is an enriching experience that immeasurably enhances one of the most solemn and meaningful days of the Jewish calendar. Prayers, insights, laws and a philosophical perspective - all are here. The essence of Rosh Hashanah is presented in the language and perspective of today's intellectually curious Jew. Because this is a time when people are coming back to their roots and searching for the meaning that has eluded generations of English-speaking Jews. This is a book for such people. Read it. Absorb it. Enjoy it. And then let its message of Rosh Hashanah seep into your being and deepen the significance of the day the world was conceived.